"Healthy Dogs Are Happy Dogs Here In The Northern Forest!" There are many aspects that make for healthy dogs; Kennel management, Housing,Exercises, Nutrition etc. Today, I would like to discuss Nutrition. I understand many mushers have different methods of dealing with this subject. I want to relay to you the way we deal with Nutrition here at Miortuk. Please understand, the following is the way we deal with this subject here. One thing, we can all agree with, nutrition is very important for health of these Canin Athletes. Here, we use a predominately a raw meat diet! Due to accessibility of high quality meat at a very reasonable price raw meat (beef & chicken), our primary diet is meat based with about 10% dry food. The reason for beef is for muscles and chicken for the fat for energy. We have found that the beef doesn't have enough fat content to meet the training/racing requirements of our athletes and chicken fat is absorbed by the dogs more quickly. Here we have very severe Winters with an abundance of snow and extremely cold temperatures. It is for this reason, we need to have chicken as part of our daily diet to maintain the dogs weight and energy to perform to their utmost. Currently our meat ratio here is 60% chicken, 40% beef 10 % dry food and water for hydration. The mixture makes a thick soup. We maintain the same mixture all year long only varying the quantity during the different seasons. Obviously more in the training periods and the Winter to meet the dogs requirements. We try to maintain the same diet throughout the year not to upset the the dogs digestive system with changes of their diet. Although the dogs will put on a little more weight during the offseason, they enter the start of training carrying a little more weight which they can work off during training. It is much easier this way than to have them start the season underweight which is then very hard to put weight on them. Mind you the meat used here is "raw" not cooked! Cooked meat takes away some the natural properties of the meat. Never cooked meat with bones as the bones can splinter and cause serious health hazards for the dogs. We feed here at the same time every day to keep them on a regular schedule. The amount of food will vary with each dog depending on their requirements and ability to process their diet. Here, I strive for an absorption of 75% to 80%. This means the dogs are getting the most out of their diet. If you are getting more stool than that, they might be fed too much or poor quality diet. It is understandable that everybody does not have access to the quality of meat we have here so you need to adjust your diet with what is available to you locally. If you have to use dry food as your base diet, we have found that you should be looking for a food with 30 % protein and 20% fat as minimum. The primary ingredient in the dry food should be meat! Read the label of ingredients, this is very important. Cheaper priced food doesn't necessarily save money, as the dogs will need more volume of food and produce more stool. If you want your Canin Athletes to perform to their optimum , you must feed them good! "According To The Calendar Spring Has Arrived, Not So Here In The Northern Forest!" Although the official first day of Spring was March 20th, Winter type conditions here continue! Yes. we had a few nice warmer days earlier in the week. However, Friday snow, sleet and freezing rain along with strong winds continued through the day into the evening. Saturday, nice and sunny with strong winds and cold temperatures. The forecast is for cold temperatures through mid week and then warming up. The accumulated snow from the Winter is slowly melting. The dogs are enjoying their time off and basking in the Sun. The daily schedule of feeding, cleaning and spending quality time with each dog is a welcomed pleasure. For both the dogs and me! This week, I took some time to look back at videos taken at the beginning of the season (each run here is videoed) and it is always interesting to see the progress of the dogs throughout the season. Above is a video of the first run in October and below of one of the final runs of the season. "The Winter That Never Wants To End Here In The Northern Forest!" Although, I enjoy Winter & the snow, it is time for Spring to make its appearance! It has been a Winter of record amounts of snow, frigid temperatures and beautiful trails. A great Winter for running the dogs, training new Leaders and fine tuning both the "A" & "B" Teams. The video above is of the "B" Team on its latest run. It, is also time for some R&R for both the dogs and me. The dogs had a total to date, of over 350 miles on them (over 700 on me). So, the dogs have gotten a break and I have enjoyed following the Iditarod Race across Alaska. Last Tuesday Yoda left here with her new family from UpState Maine to enjoy new adventures. Yoda is a very good young Leader, but will be better suited to be in a family situation and running with smaller teams. This week, we had some nice Spring temperatures that significantly reduced the amount of accumulated snow. However, today Winter returned with more snow and white out conditions caused by the high winds. The weather here today seems to change every hour. Below are some photos taken this morning. "Spring Type Weather Starting To Arrive In The Northern Forest!" This week started off with another dump of snow (25-30 cm) and then nights with temperatures in -30's celsius. But, during the days the temperature is warming up to just a little below 0 and in the + range in the sun. We got out this week for two days running both the"A" Team & the "B" Team. I am so pleased with the performance and continued enthusiasm of all the dogs. Even with the extreem temperatures and the running, we have been able to keep them with a good running weight. This week Lance got to run again at Lead and you can see (in the above video) he is getting more comfortable at that position. He and Kira make a good pair at Lead and will only improve next season. On Saturday, Manon had a her first ever run by herself with the dogs in a 4 dog team. She did very good and had a nice fast run on a beautiful trail. This week, all the handlers left here to continue their adventures in Canada. 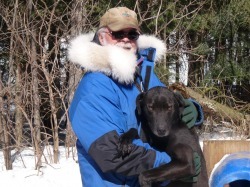 They did a great job here with the dogs and dealing with the abundance of snow this winter. ​Their help was gratefully appreciated!